Where to Buy 3M Organic Vapor Cartridge, 3M Organic Vapor Cartridge 6001 - Pack of 2 - $12.95 for Sale with Fast Free Shipping! 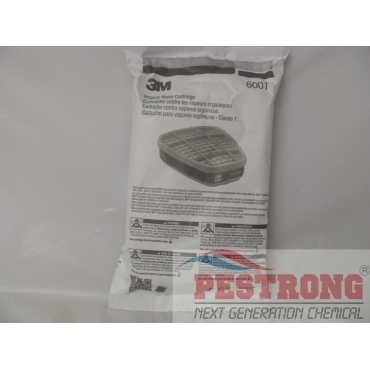 3M Organic Vapor Cartridge 6001 - Pack of 2 used with 3M Half and Full Facepieces 6000(6800, 6900), 7000 and FF-400 Series with bayonet filter holders. The 3M Organic Vapor Cartridge 6001 helps provide organic vapor protection in a variety of environments. The cartridge may be used for vapor concentrations up to 10 times the Permissible Exposure Limit (PEL) with half facepieces or 50 times PEL with quantitatively fit tested full facepieces. Recommended applications for the cartridge include assembly and mechanical, batch-charging, change-overs, chemical dispensing, clean-up, cleaning, painting, parts cleaning, and seal coating. Inventory needs and training requirements for safety equipment are reduced because this respirator cartridge selection works for many different applications. Industries in which this cartridge is commonly used include chemicals, construction, oil and gas, and transportation. The cartridge is NIOSH (National Institute for Occupational Safety and Health) approved for environments containing certain organic vapors. The cartridge has been assigned the color code "black" in the NIOSH system. Breathing organic vapors can pose a risk to your health. NIOSH, a Federal government regulatory agency, has tested and approved the 3M Organic Vapor Cartridge 6001 to help reduce exposure to certain organic vapors. This consists pack of 2. Wonderful pillowcase. I bought this for my son who sweats a lot during his sleep. He has sweated through a few pillows already and I was looking for a pillowcase that will protect the pillow from getting destroyed, but I didn't want to get vinyl cases because that just sounds uncomfortable. I found these and got one and put it on my son's new pillow. After months of using this, his pillow is nice and sweat stain free and it was nice and comfy for him too. I went ahead and bought a bunch for me and my husband and some for backup as well!